In Naga, in the Bicol region in the center-west of the Philippines, September is a time of intense religious and civic celebration organized around devotion to Bicol’s patron, Our Lady of Peñafrancia, who is endearingly referred to by her local devotees as Ina, or Mother. 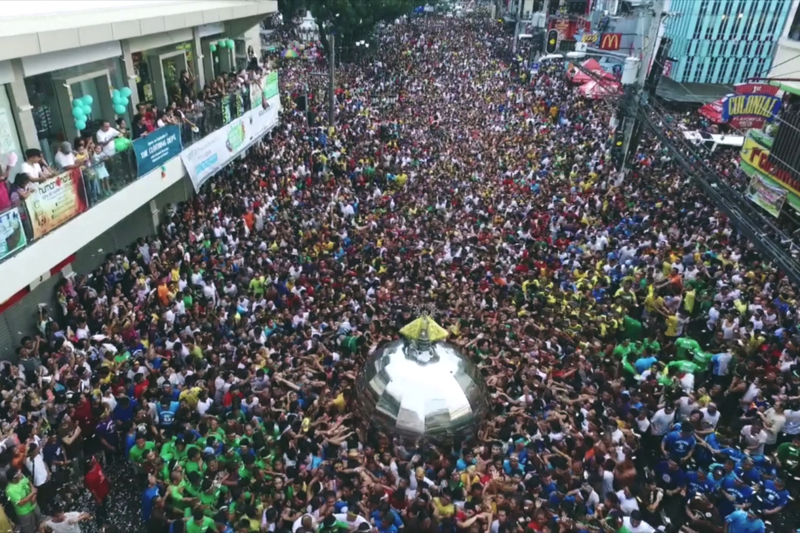 As is true in a number of instances in the Philippines, the Peñafrancia festival actually links two seemingly unrelated feasts to make one extended celebration.1 In this case, the pairing includes the Divino Rostro, the Divine Face, celebrated on the second Friday of September, and Our Lady of Peñafrancia, celebrated the following weekend. 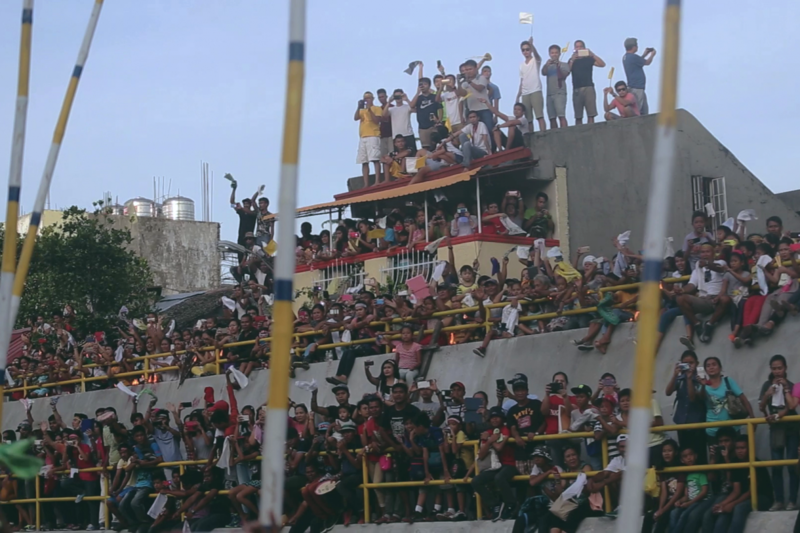 Both celebrations are important to locals, but the Peñafrancia celebration draws the most vocal and fervent devotion. 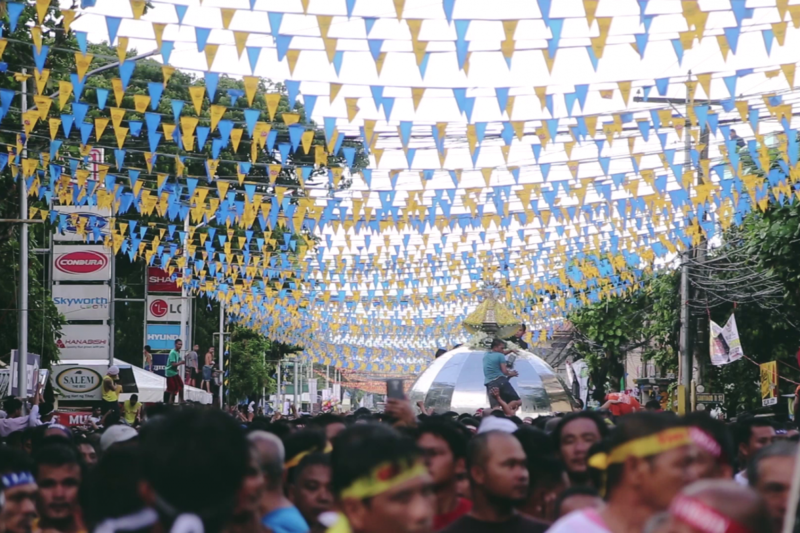 The Peñafrancia festival has come to be an important marker of the city’s identity, so much so that Naga often refers to itself as the “pilgrim city” in its public relations initiatives. 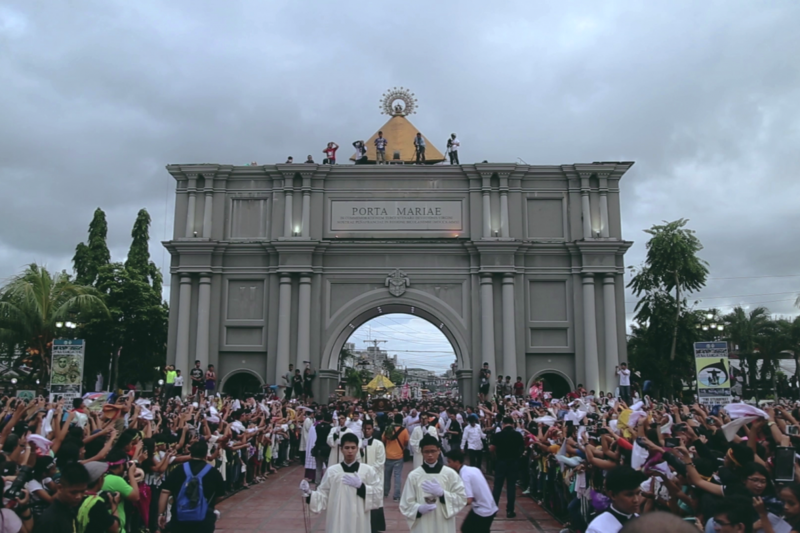 The city is even home to a massive triumphal arch, the Porta Mariae, with a gold image of Our Lady of Peñafrancia on top. Religious pilgrimage is a core element of the Peñafrancia events, but the weeks surrounding the actual feast days are packed with a diverse and seemingly secular array of civic celebrations including women’s beauty contests, a “Pretty Boy Bicolandia” contest, tattoo festivals, a dog show, concerts, a triathlon, a skateboarding competition, a military parade, a chess tournament, dance events and a Peñafrancia “run” at the shrine. 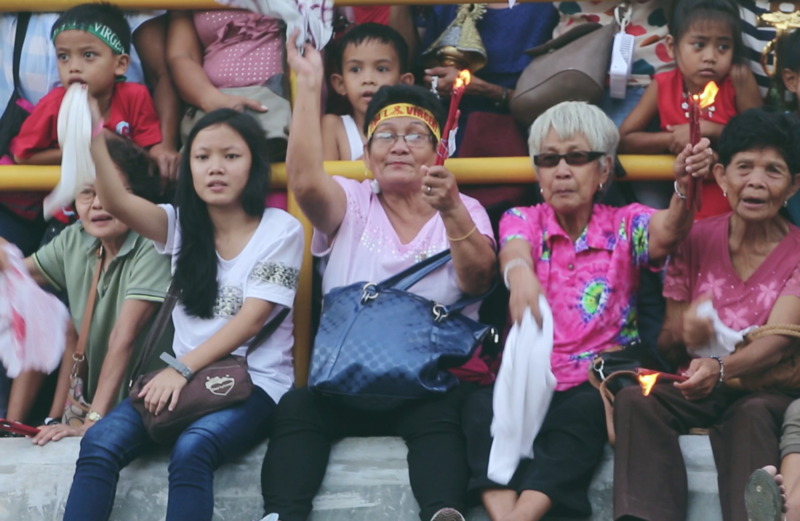 In Naga, however, these seemingly “secular” events are often spoken about as heartfelt forms or proofs of the people’s devotion to Ina. 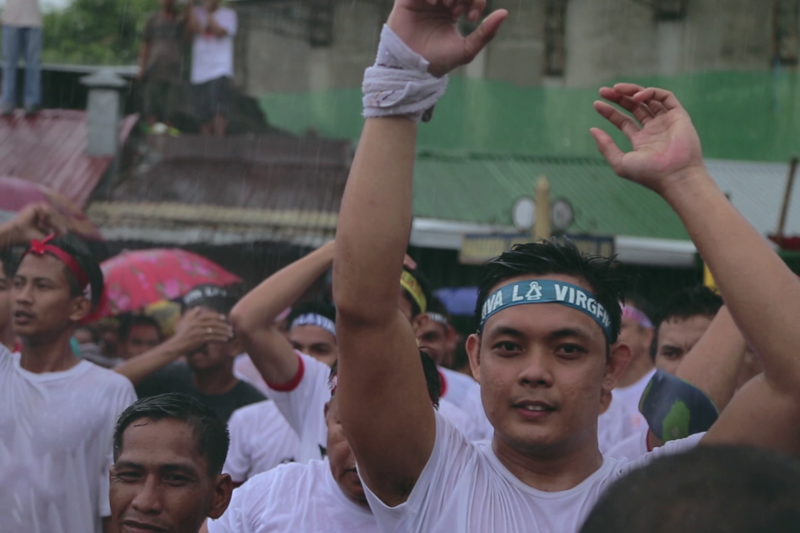 Participants in these events often wear headbands or carry banners printed Viva la Virgen or Viva el Divino Rostro. The number of attendees is hard to determine. The city’s normal population is under 200,000. Some locals claim that five million people attend each year, though that number equals the province’s entire population. 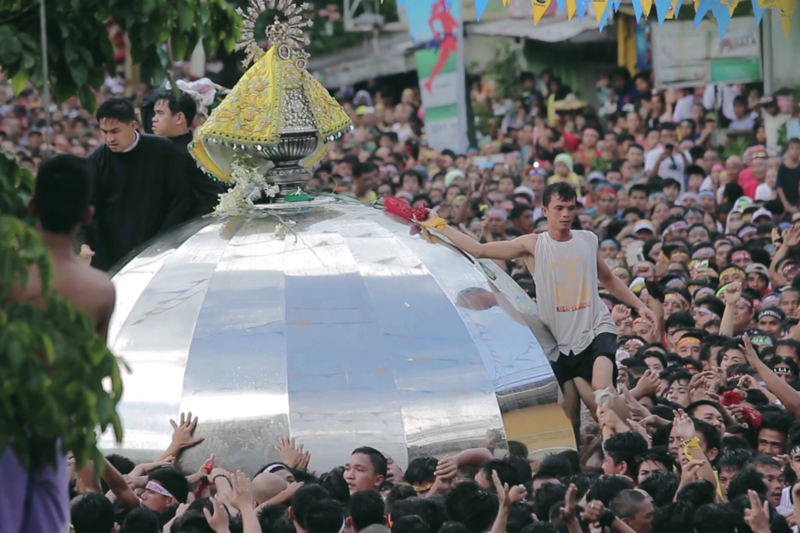 Others claim it as the largest annual Marian pilgrimage in Asia, or in that part of the Philippines. A 2017 newspaper account claims that 1.8 to 2 million devotees were in attendance.2 Whatever the numbers, it takes over the city for the better part of a month. The Divino Rostro is the image of Jesus that is said to have miraculously appeared on Veronica’s veil when she wiped his face en route to the crucifixion. 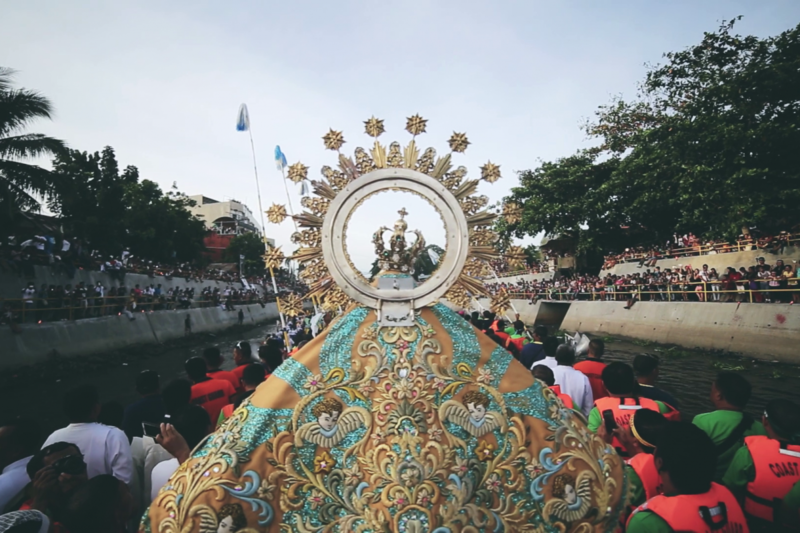 The devotion to the Divino Rostro in Naga City started in 1882 when a cholera epidemic broke out in Manila and reached Naga. Cholera was incurable then, but as locals tell it, on the third day after the image of Divino Rostro was placed at the altar of the Cathedral, the epidemic which had claimed many lives of people in Naga finally ended. 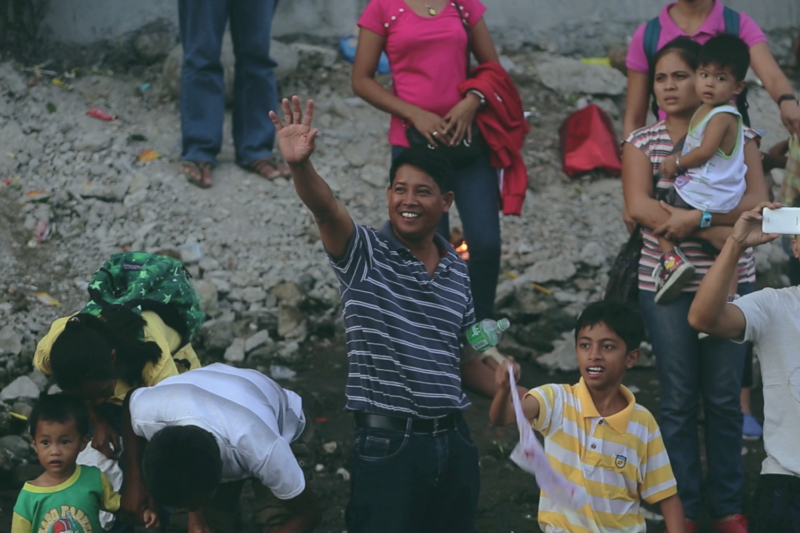 Word of mouth spread and fostered devotion to Divino Rostro throughout the region. 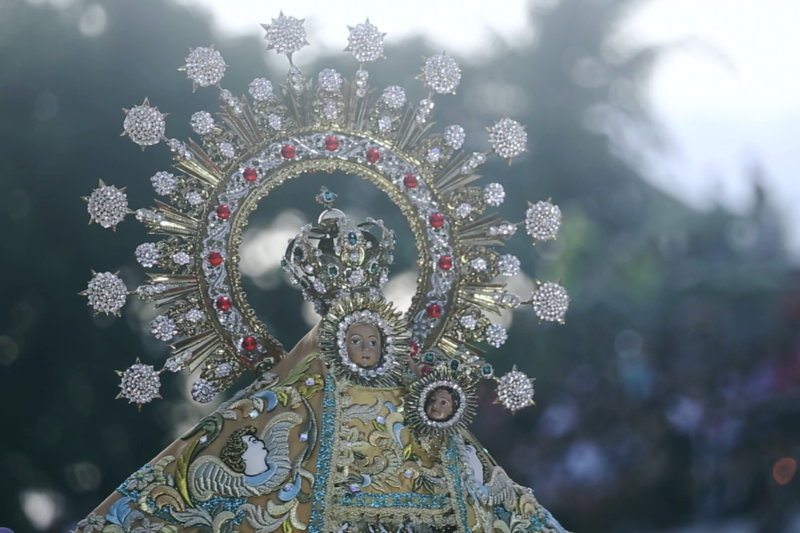 The image of Our Lady of Peñafrancia is Spanish in origin, though the small 300-year-old Filipino image is quite distinctive from the original Spanish one. The original, on a hilltop shrine in Salamanca, Spain, is a brown-skinned image of the Virgin and Child, whereas the image in the Philippines is white. 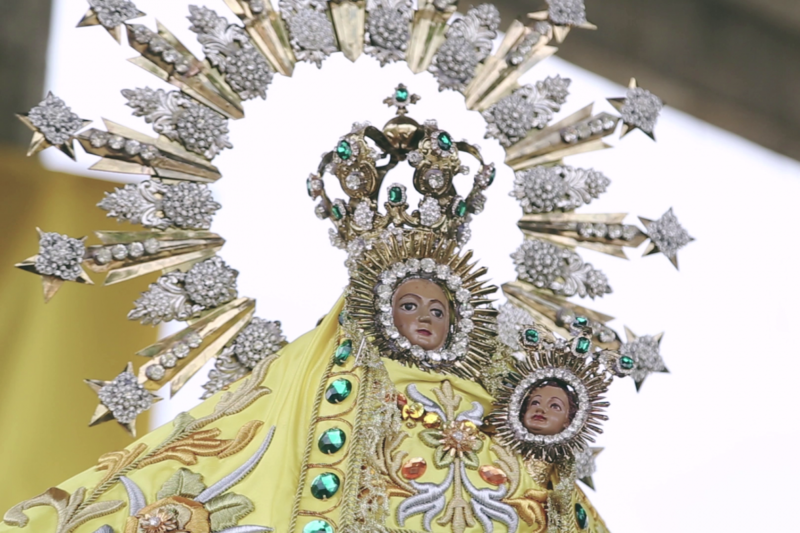 The elaborate cape, dress and crowns on the Filipino version obscure all bodily elements of the mother and child except their faces. Though hard to discern because of its tiny size, the image of Jesus is adult-looking, not child-like. The original Filipino image is at Peñafrancia basilica, a modern church built specifically in honor of this devotion. Copies are to be found in many places in the region. The occasion of the Divino Rostro feast is the translacion, or translation, of the Divino Rostro image to the cathedral in Naga City in 1885. 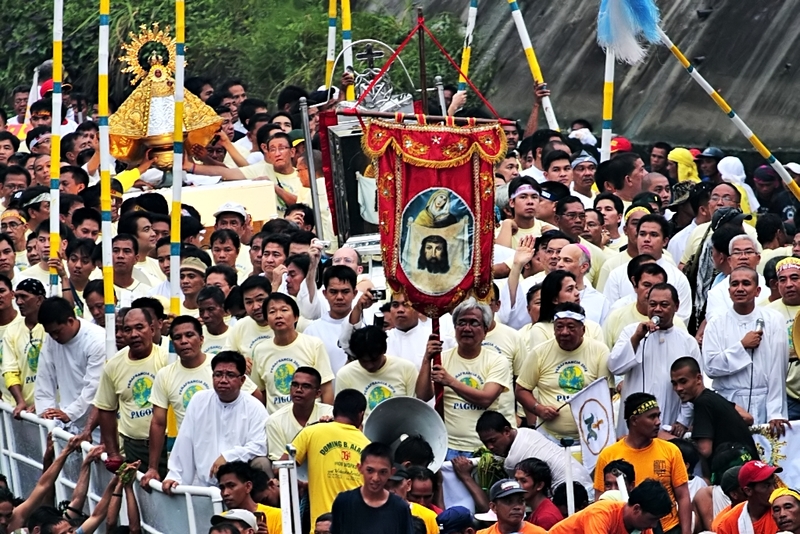 Though unusual as an occasion for celebration in other parts of the Catholic world, in the Philippines a translacion can be an especially meaningful occasion for religious commemoration. 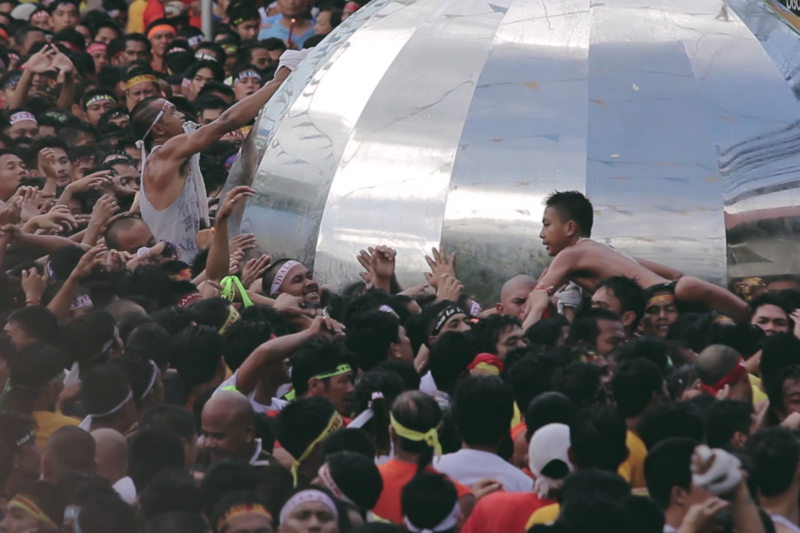 The commemoration of the translacion of the Black Nazarene in Manila, for example, draws millions of devotees each year. The movement of an image to a new home and its presence in the streets, even though it can otherwise be viewed year-round in the church, can draw enormous crowds. In 2015, the feast was linked to Church’s Year of Mercy. 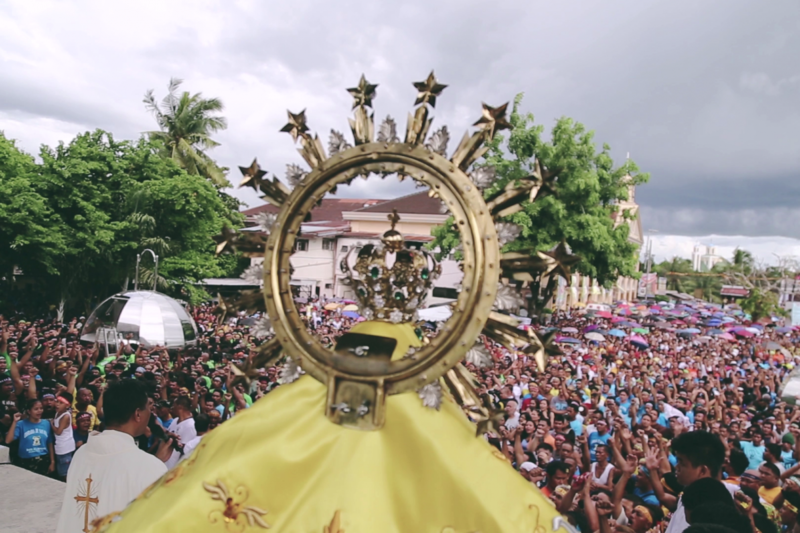 It began as always with a novena—nine days of prayer—starting on September 1 with an early evening Mass and procession of the Divino Rostro from Our Lady of Peñafrancia Basilica to the Peñafrancia parish church. Each day during the novena, from September 2 to September 10, there were dawn and evening Masses, confessions, and at least one penitential procession, often at dawn, at the parish church. The days were each addressed to a different group—youth, families, educators, the sick, poor and prisoners, and government workers among them. The feast of the Divino Rostro, which falls on the second Friday of September3, was the first high point of the celebration. That day began with a large predawn candlelight penitential procession. Women, traditionally barefoot, were the only people allowed to draw the ropes or carry the anda (carriage) bearing Ina as it moved from the basilica to the parish church. In the afternoon translacion, when Ina was transferred from the parish church to the Metropolitan Cathedral Church, only the voyadores, male devotees, also barefoot, were allowed to bear the anda. 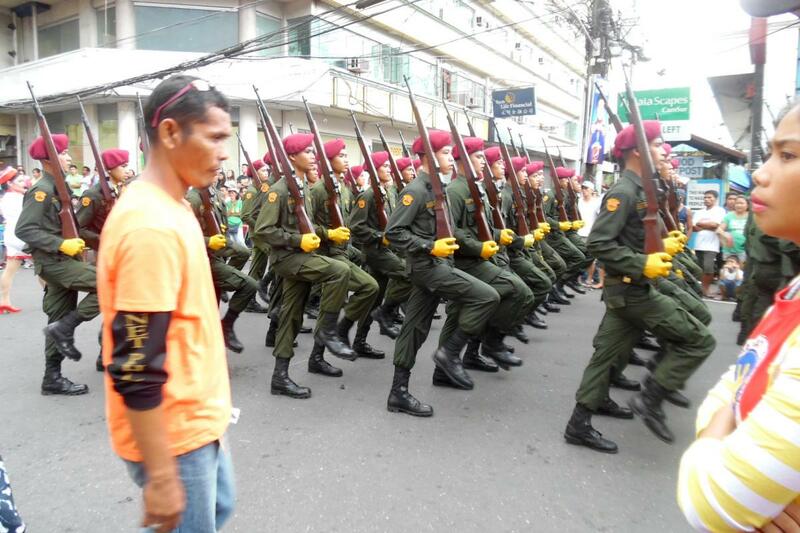 This procession lasted nearly five hours. Masses ran throughout the day, with a solemn pontifical Mass celebrated by many bishops at 5 p.m. The arrival of Ina on the feast of the Divino Rostro marked the beginning of a second novena, from September 11-19. The first day there was a pre-dawn procession of Ina and the Divino Rostro. That day, and the days that followed were also marked by Masses (including pontifical Masses for pilgrims from nine different dioceses in the region), confessions, visits to charitable institutions. As with the previous novena, each day was themed for the needs of a particular group, such as youth, educators or the poor. Alongside these more typical Catholic events (Masses, visits to the shrine, processions of the images), other major activities were celebrated on the days of the novena as well, all of them seen to a significant degree by participants as signs of devotion to Ina and the Divino Rostro. 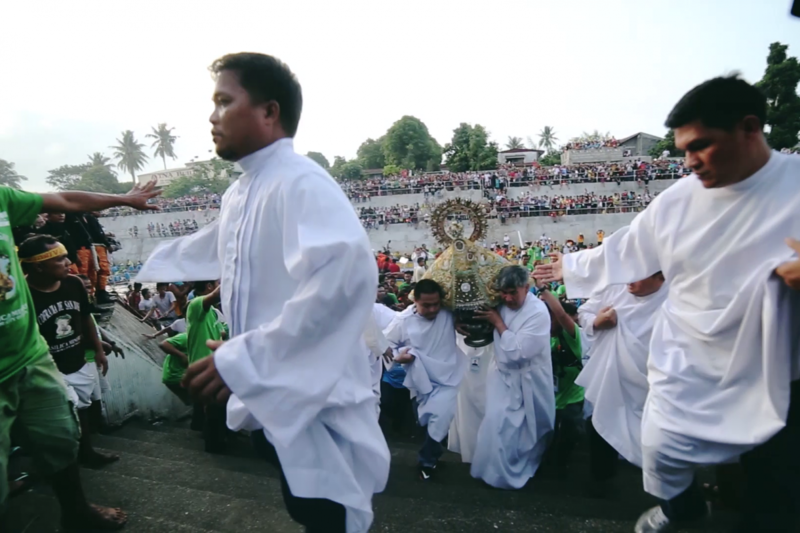 Though many people at the parades and beauty contests might not have attended church activities, for most people in Naga the division between sacred and secular events was much thinner than it might appear to outsiders. Tuesday featured a daylong, very entertaining region-wide cheer dance competition, with entrants from almost all schools in Bicol region. 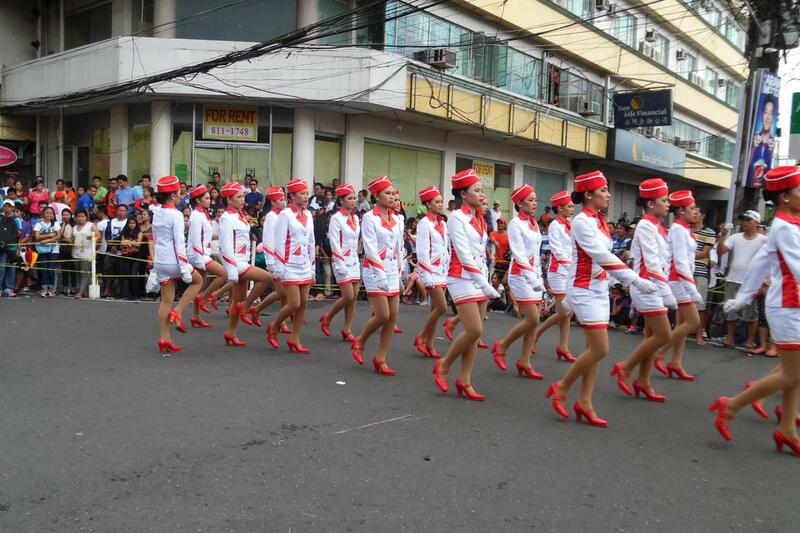 Wednesday featured a daylong parade competition of boy and girl scouts of the Philippines, and drum and lyre corps and majorettes from different elementary schools in Bicol; Thursday was the day for a civic parade, with a float bearing the winners of Miss Bicolandia, a brain and beauty competition for the entire Bicol region, then hundreds of floats honoring Ina, and a street dance competition by different schools from the region. 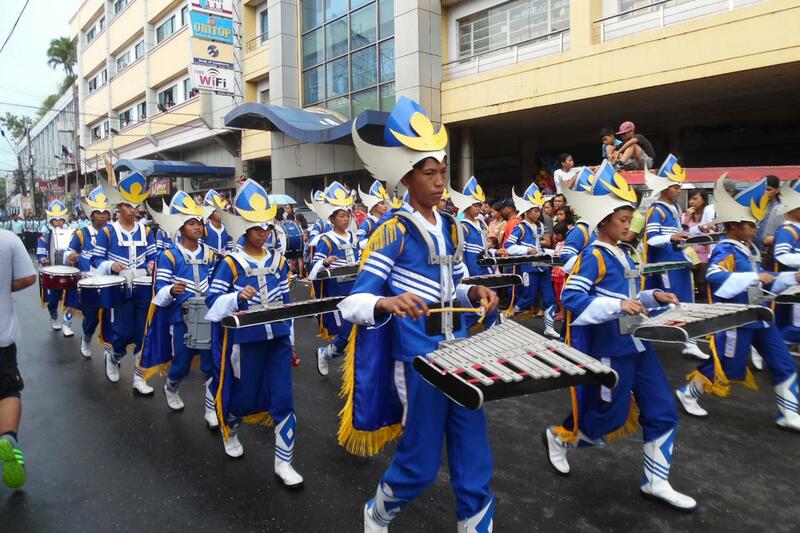 Friday, the penultimate day of the novena, was given over to the most awaited civic event, a century old “Bicolandia military parade,” the longest parade in the country outside Manila. 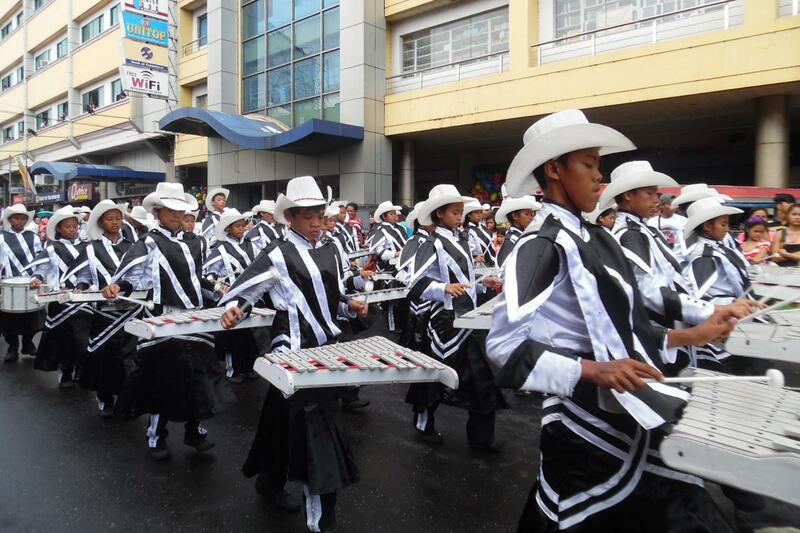 It drew from all high schools, colleges and universities in Bicol, and included members of the Philippine National Police and the Armed Forces of the Philippines. On Saturday, the last day, there was morning boat racing for individual, and team competitors in the Naga River, in anticipation of the fluvial procession to be held in the afternoon. 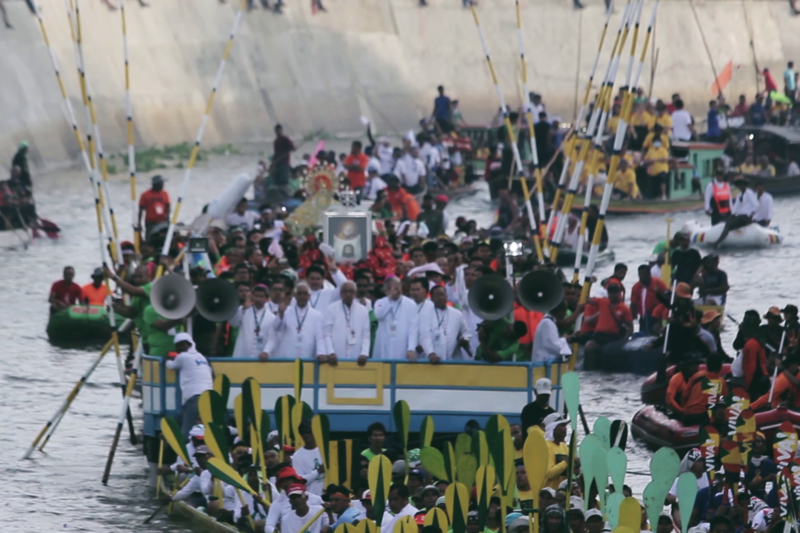 Saturday afternoon, on the eve of the feast of Our Lady of Peñafrancia,4 the images of Ina and the Divino Rostro were transferred from the cathedral back to Peñafrancia basilica in a rowdy “fluvial procession” on the Naga River. The images of Ina and the Divino Rostro rode on a pagoda, or shrine barge, with a band of musicians, bishops, priests, church workers, guards and devotees on board. 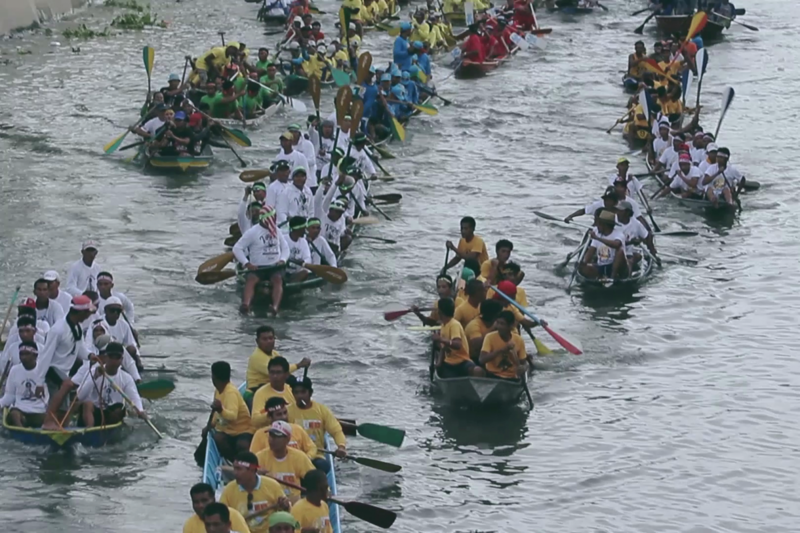 Dozens of long canoes packed with young men in brightly colored team uniforms led the procession as they competed to paddle fastest, often splashing at each other, and escorted Ina and the Divino Rostro on the pagoda boat along the river. 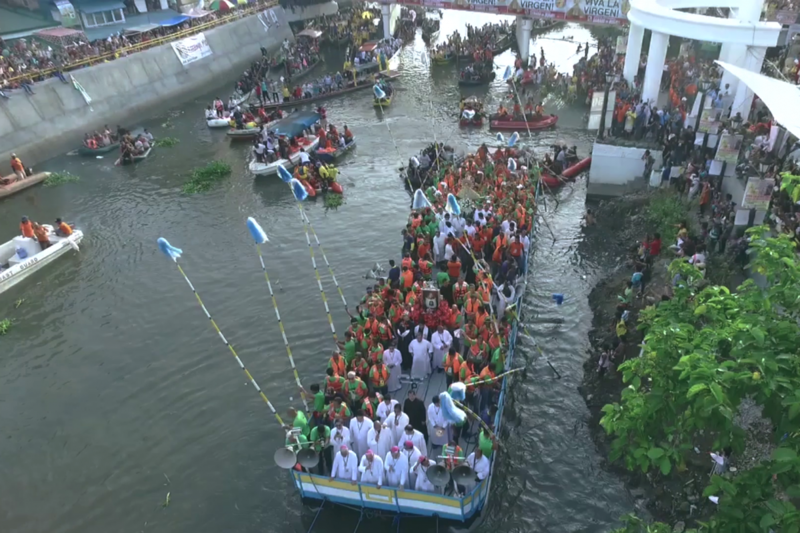 Bicolano folk custom specifies that women are not allowed on the pagoda or in the canoes, as it will “surely spell disaster.”5 Only approved groups of voyadores are allowed to paddle as teams. From the shores people set off fireworks and shout “viva la Virgen” while the boats paddle by. Other boats following the pagoda bring with them their own versions of images of Ina. 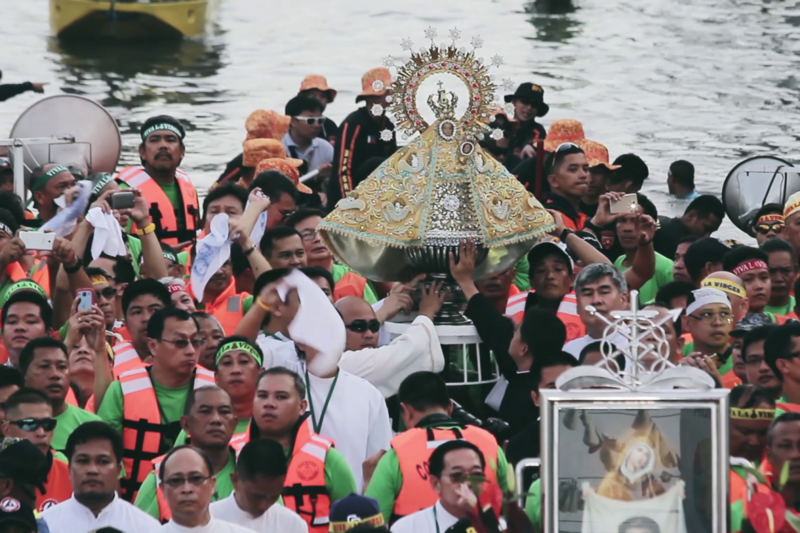 The Archbishop of Nueva Caceres met the images of Ina and Divino Rostro at the end of the fluvial procession and led them to the Basilica of Our Lady of Peñafrancia where a solemn concelebrated Pontifical Mass was be held in honor of Ina. Pilgrims and local devotees alike at the festivities said that they came because they knew that Ina would always grant their wishes and petitions quickly. 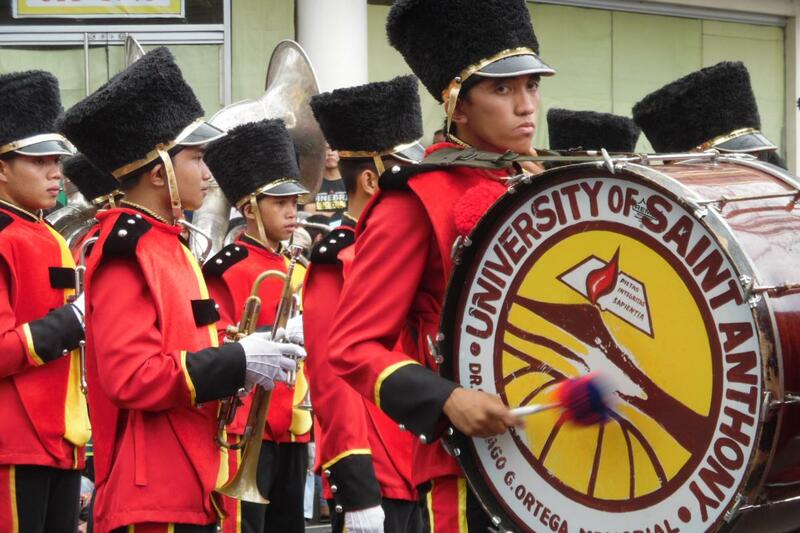 Pilgrims who were interviewed came from as far as Mindanao, and from disparate areas like Luzon, Visayas, and Cebu. Many said that they were fulfilling a panata, or vow, to attend the festivities annually. The fervor and testimonies of other devotees often played significant role in their decision to come for the first time. 1. See, for example, the pairing of three feasts days at Obando into a three-day feast. There, the normal date for Saint Clare’s feast is even transferred to make this work. 2. Juan Escandor Jr., and Rey Anthony Ostria, "Feast for ‘Ina’ reaches climax, draws millions to Naga" Philippine Daily Inquirer, Sept 17, 2017. 3. In 2015 this fell on September 11, which determined the exact dates of the novena beforehand. 4. In 2015 the Saturday vigil fell on September 19. 5. 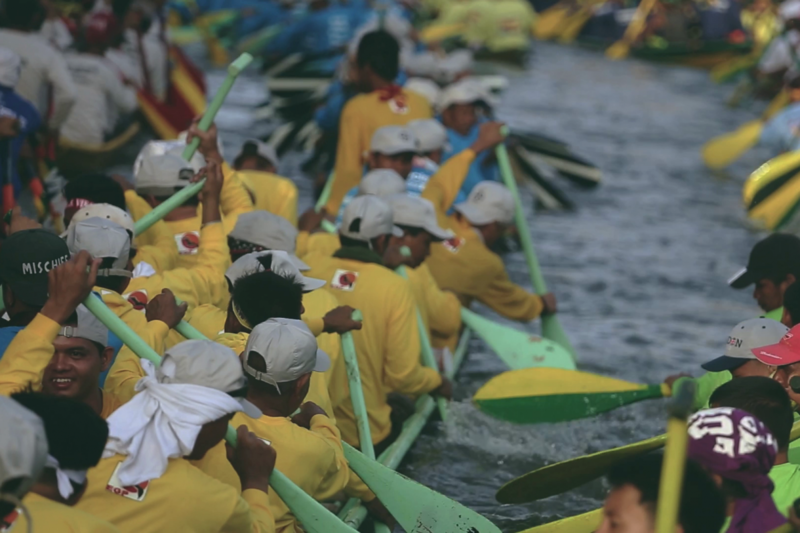 The canoes that paddle along the procession are all male, but there are, in fact, many other boats that follow right after the procession that do include women.